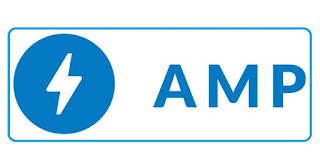 How to Easily Edit AMP Blog Post - For those who try AMP HTML with a new blog, of course, there is no problem with blog post because we make a new post which of course direct valid HTML. But it will be a problem for those who use AMP HTML on blogs that already have many posts. Because by using AMP HTML then automatic its post will have an AMP error so that the page posts become invalid AMP. Maybe someone asks, "Why all posts with AMP blog must be valid AMP?" Google says that a valid AMP blog will have a "lightning" AMP icon in the mobile search results, but while this feature is still experimental. And now Google has changed the priority of the search index to "mobile index first", meaning the mobile search index is preferred from desktop search. "Then how easy is it to edit AMP blog post?" Make a "dictionary edit post" in notepad so that we more easily remember or copy the code needed as <noscript> to image thumbnails, amp-img, amp-iframe, amp-youtube and other necessities in the post. This is what usually bothered in validating AMP posts. That is the number of inline style CSS in tags div like <div style="text-align: justify;"> and others. It will be quite draining if we edit one by one the code <div style="text-align: justify;"> becomes <div>. Because Blogger post editor does not have search and replace feature, so I suggest using a browser extension to search and replace to make it easier to change code <div style="text-align: justify;"> to <div>just one click. Please install the browser extension and it will appear in the top right corner of the browser in the form of search icon. Then please click the extension icon then please fill in the code you want to change in Search for box and replacement code in Replace with box. Then check on Match Case? and input fields only then click Replace All.